This weekend my kids invited friends up to the mountains so we had a house full. I decided since most were arriving around the dinner hour I’d have a nice big meal waiting for everyone that would provide plenty of leftovers. The main course was my Sweet & Sour Brisket always a hit along with veggies, potatoes, and salad. The finale was an outrageously delicious, overly rich chocolate dessert with layers of something special for everyone, then smothered over a scoop of ice cold vanilla ice cream,ooey gooey hot fudge and heath bar bits. I’m pretty sure this is a heart attack waiting to happen but hey, we all deserve a treat every once in a while. Plus it would provide leftovers for all to nibble throughout the weekend. I have to tell you I saw a photo of this dessert on Pinterest and the moment I laid my eyes on it, I knew I had to make it. In a 9×13 pan, sprayed with non-stick spray, take a refrigerated package of Toll House Chocolate Chip Cookie Dough and line the bottom of the pan with the cookie dough. Then lay a single layer of double stuffed Oreos on top of the raw cookie dough. 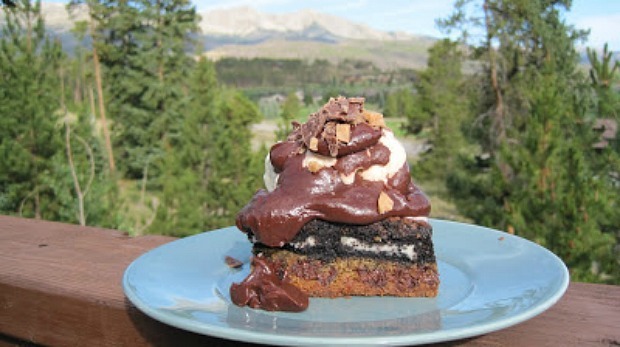 Follow package directions on a family size box of Chocolate Fudge Brownies and spread over the top of the Oreos. Bake in a preheated 350F degree oven for 30-45 minutes until firm but not hard. I prefer mine soft, however if you like your cookies crunchy you might allow for 45 minutes. Let cool. Then cut into squares and top with ice cream scoop of your choice, drizzled with Hot Fudge and topped with Heath Bar crumbles. So good and oh SO RICH! Prepare ingredients for cookie dough then spread out onto bottom of a 9×13 pan sprayed with non-stick spray. 2. 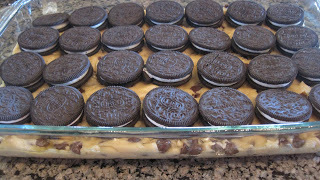 Package of Double Stuffed Oreos – lay Oreos out in a single layer over the top of the cookie dough. Directions for Brownies: Prepare batter then spread over the top of the Oreos. I didn’t add any nuts to my brownie batter. Now that you have all the layers together, place in a 350F degree oven and bake for 30 minutes or until done to your desired texture. Hot Fudge – While the Chocolate Triple Decker Bars are baking in the oven whip up a batch of thick rich hot fudge. So easy to make and perfect everytime. This is a recipe I’ve been using forever. I first tasted it as a little girl when my family use to vacation over the holidays and eat at Juniors Restaurant. This is Juniors Hot Fudge recipe. Melt the butter in a small saucepan over medium heat. Stir in the cocoa, chocolate, and salt, and cook until the chocolate melts. Slowly stir in the milk and cream and heat until the suace is smooth and warm. Stir the sauce constantly and watch it carefully so it does not boil or stick to the bottom of the pan. Remove the sauce from the heat and whisk in the vanilla. Store any leftover sauce in a covered jar in the refrigerator. To reheat add an extra tablespoon or two of cream and stir constantly over medium heat until hot. To finish the dessert: Place a scoop of ice cream on square of the Chocolate Triple Decker Bar and smother in hot fudge, then top with crumbled health bars. DELICIOUS & RICH – ENJOY!!! Great looking dessert. Easy to make (your version takes only a few minutes more than the first one), and so much flavor! Everyone must have loved these! Love the scenery in the background on the picture. As a matter of fact, last night at dinner much to my surprise my sons friend told me that this dessert was the best he’s ever had. Now I’m not sure if he was just trying to flatter me but it came up out of no where – so I’m thinking he must have really meant it. There’s not a crumb left of it. Easy, rich and delicious! I prefer fresh made as well vs out of a box or package. However, I think for those that want to throw a wow dessert together fast doing it the semi-homemade way is always a nice option, but I think I’d still make the hot fudge from scratch. I want to make something like this for our weekend outing next week and I am definite everybody would love it. Good that I have gluten free oreo cookies at home, just have to figure out other layers. Truly a rich decadent bar! Have you checked out http://www.KingArthurFlour.com? They have a list of gluten free recipes and I would almost be sure they have a gluten free brownie and chocolate chip recipe. Oh wow, your children (and their friends) are so lucky! Sweet & Sour Brisket and this dessert? So jealous! I see the vast scenery behind the sundae… so beautiful! It was perfect because my husband loves Oreos, my daughter brownies and my son chocolate chip cookies.. Everyone was happy. It’s so rich so large pieces aren’t needed but it was gone in no time at all.. I have made these before and yes they are fantastic, I’ve changed them up by using butterscotch chips and also peanut butter cookie dough and they are always eatin up in a hurry! I bet peanut butter cookie dough would be delicious. My family prefers chocolate chips to butterscotch but I can see so many variations. I actually saw a chocolate chip stuffed Oreo cookie today. There’s no end to the creativity. Oh my, how I want some! That looks incredible! Oh my goodness Vicki….that looks absolutely delicious!!! must make! Oh, YES!!! This is right up my alley! I love when I get a chance to feed a group…perfect time to make decadent desserts without fear of eating it all myself! Oh My! Looks like you were feeding a bunch of growing boys! This dessert is definitely off the charts! What a hit with the guests! This would be a hit in our house too! Looks irresistible! Wow! I’m not sure I’m impressed more right now by the dessert or the view from your porch. Both look gorgeous and irresistible. This would make a wonderful, special-occasion dessert! I’m sure your son’s friend was right about it being the best dessert ever. All i can say is yum! And that view would probably make anything taste wonderful but this dessert is definitely a keeper recipe! What a great dessert. Very delicious and a crowd pleaser I’m sure. What a treat!! It sounds like you had a super meal waiting and the recipes for the sundae’s are fantastic! This is simply DIVINE! I could just dig int right away! Hmmmmm….I may have to try mixing some cornstarch with the peaches next time I make a tarte tatin…it certainly couldn’t hurt! I hated losing all those caramelly juices! Whoever that houseful is, they must LOVE YOU. I think I’m somewhere in between semi-and fully homemade on this one. That’s a lot of work, but also I’m glad to see a good brownie recipe. Been wanting one.